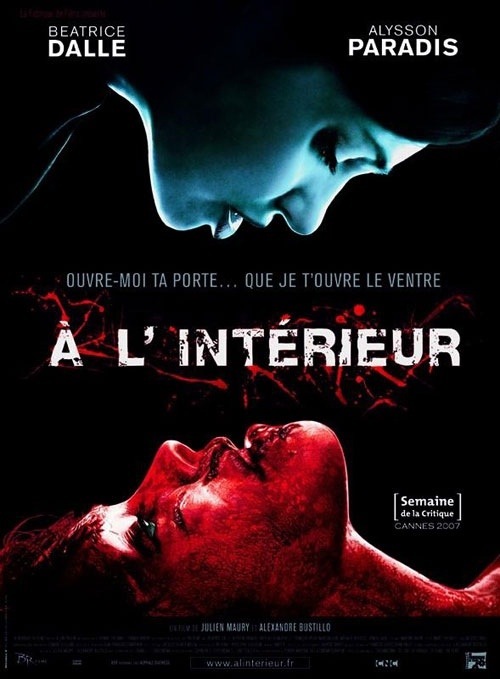 After the success of Alexandre Aja’s High Tension the door was kicked wide open for French horror and when Inside was released it was getting rave reviews and some hailed it as an instant classic. Going into the movie I wasn’t quite sure what to expect since some of these films that receive such praise I often walk away wondering what was so great about that? But the rave reviews for Inside was right on the money and this in my opinion was the best film of the decade it would be in the top 5 in any decade for that matter. Horror is a genre that will never fade and while every so often there might be times when the genre can be weak the reason horror has remained so popular is due to the fact there are so many directions to go; you have horror flicks that are serious, some that mix comedy, drama and some simply meant to be fun and not be taken seriously, but some people think horror is only meant to be fun and anything too serious isn’t any good. While I enjoy light horror flicks, but horror is meant to bring fear and Inside succeeds on all levels. This is the kind of movie that has no boundaries and there is no line the filmmakers won’t cross. Wes Craven with Last House on the Left, Meir Zarchi with I Spit On Your Grave and Ruggero Deodato with Cannibal Holocaust were filmmakers not afraid to cross that line and make a movie that would shock and disturb and could even borderline on bad taste maybe and while Inside is a different kind of movie, but like those filmmakers, Alexandre Bustillo & Julien Maury the directors of Inside also make a movie that shocks and disturbs and they don’t walk the line the jump right over it! Inside is extremely graphic and bloody, but unlike many films that use that as a gimmick to make up for bad filmmaking, Bustillo & Maury use violence and gore to further create tension and scare the audience; despite what many have said about the violence in Inside this isn’t the kind of movie that has violence from opening to closing, but it’s spread out nicely and when the violence does happen its raw and brutal and will leave you numb and like I said the violence and gore isn’t used as a gimmick, but rather add to the suspense and tension. The screenplay by Alexandre Bustillo was excellent and well plotted, but this isn’t the kind of flick that really needs to develop the characters. That’s not to say the characters aren’t any good, but the way the movie was constructed the characters work perfectly in regards to what is happening. Sarah (Paradis) is pregnant and her husband is killed in a car accident, which ends up leaving her a little bitter and angry and she was very sympathetic and even though we never get to see what her life was like before there are a few nice touches in the script that gives us some insight. There really isn’t anything about the screenplay that stands out, but it’s just tightly written and well executed. Inside was the directorial debut for Alexandre Bustillo & Julien Maury and in my opinion this is one of the great feature film debuts. From the very opening Bustillo & Maury set an eerie tone with a real sense of dread; Inside starts off a bit slow, but it’s never boring as the lead character Sarah is tragic enough to find interesting and the uneasy tone set by Bustillo & Maury really keep the pace moving along until the plot really gets going. Once the suspense starts it never lets up and Bustillo & Maury craft a movie that will have the viewer on the edge of their seat and they craft scenes that shock, scare and disturb and will remain with the viewer long after watching it; these shocking scenes will be burnt into your heard and it’s quite hard to shake. What makes Inside work so well is you never know what’s gonna happen next due to some truly horrific scenes and unlike many filmmakers, Bustillo & Maury aren’t afraid to cross that line, which is something rarely done these days. It’s like you’re in the hands of madmen and nothing is off limits and just when you think they won’t go there they do and it’s shocking, but it’s not shock value for the sake of it and that makes the images even stronger and add to the fact Sarah is pregnant it raises the stakes even more and again Bustillo & Maury aren’t afraid to go one step further and some might even find the movie offensive due to the graphic acts of violence against a pregnant woman, but this is what horror is all about; Bustillo & Maury don’t make a movie that holds back, they make a movie that is shockingly violent and brutal and hands down this is one of the greats in the horror genre. Inside is one of the scariest movie I have ever seen and one of the most suspense and tension filled as well. Like how I mentioned Craven, Zarchi and Deodato these were filmmakers that really pushed the limits with their films I brought up and in this day and age nobody has the nerve to make a movie like that since from a marketing standpoint it might be too much for most viewers who have grown so accustomed to silly slasher flicks and Hollywood horror. Most horror filmmakers play it safe and therefore even if the movie is good it’s too predictable, but the fact Bustillo and Maury are willing to push the limits the viewer has no idea what will happen next, which makes Inside such a breath of fresh air in the horror genre and if only more filmmakers would follow their lead the horror genre would be a truly great place. The performances from the two leads Alysson Paradis Beatrice Dalle are flat out brilliant; Sarah as I stated earlier is very sympathetic and seeing what she goes through in the movie and the violence against her is cringe worthy and Paradis pulls it off perfectly. For some reason whenever a horror film has a female villain a lot of people complain they aren’t scary enough. Beatrice Dalle as La Femme is one of the scariest villains to ever appear in a horror film and anybody who says women cannot be scary must not have seen Inside; Dalle is downright terrifying and she’s as scary as any male villain and in some ways maybe even scarier; she was so sadistic she might even make Krug (Last House on the Left) piss his pants. Inside is a film that isn’t afraid to push the limits and some of the scenes in this movie will have the viewer in pure shock and if you think you know how the movie will end odds are you’ll be wrong and the final few minutes are some of the most shocking scenes I have ever seen. Inside for me easily rates as one of the all-time greats and there are very few movies that truly scared me, but Inside is no doubt one of the few that did.